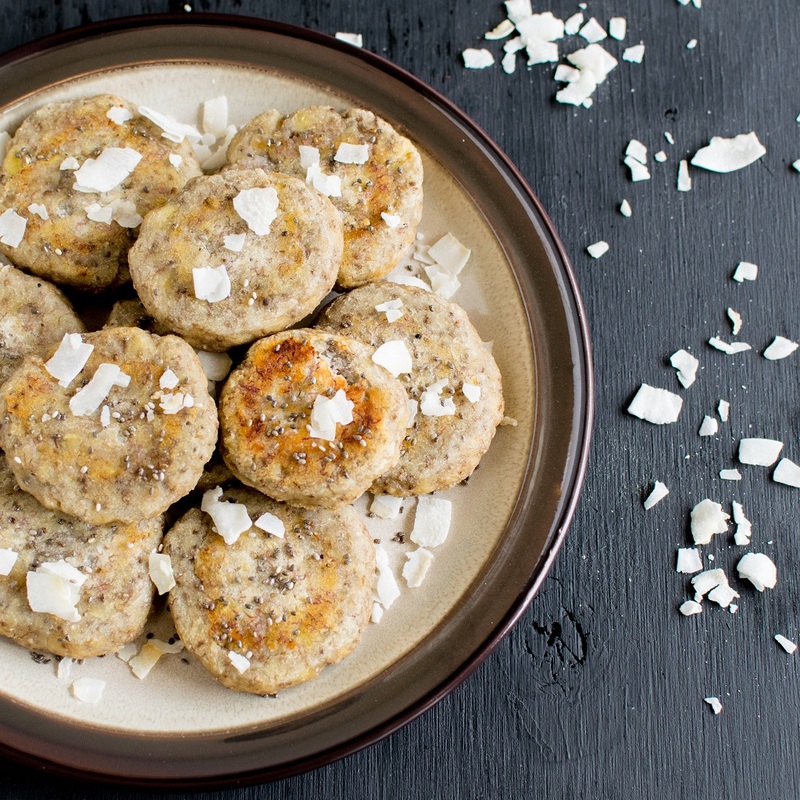 3 Ingredient Coconut Chia Energy Cookies are tasteful post work out recovery replenishment. Made with simple ingredients in about 35 minutes in minimum mess. They serve well as a healthy snack for kids with no worries of them being sugar high. The 3 ingredients that I used in these cookies are chia seeds, ripe banana and coconut flour. For this, I first soaked chia seeds in some water for a few minutes. In a larger mixing bowl mashed bananas with a potato masher. Finally, folded in coconut flour along with soaked chia seeds. Thereafter, placed about 12 cookies on a greased cookie sheet. Lastly, baked them in a pre-heated oven for 30 minutes. Vegan and paleo energy cookies were ready without much hassle. Chia seeds – Apart of being a great egg substitute this super food is high in protein and omega 3 fatty acids. In addition to being gluten free chia seeds are high in fiber. Chia seeds are extremely versatile and fits in well in almost any recipe be it sweet or savory. Banana – Again a great egg substitute. Not only its high in potassium but a fiber rich fruit as well. Banana is delicious and a versatile fruit to be used in any dessert. Coconut flour – it is high in fiber, protein as well as healthy fats. Most importantly coconut flour is gluten free. It’s great for grain free baking. My idea behind this recipe was to come up with healthy post wok out recovery food. Rohit has been training for full marathon throughout spring. Along with protein shakes as well as other energy drinks I wanted to give him some homemade energy foods. I wanted to provide him with a variety of food. Also I wanted to provide him with a little extra nutritious food for his well-being. While I was planning for this recipe, I came across many of my friends and relatives who are also training for some sport activities this season. At that moment I realized that 3 Ingredient Coconut Chia Energy Cookies would definitely be desirable. The energy cookies would suffice for that extra little nutrition which is sometimes required when training for any sport. 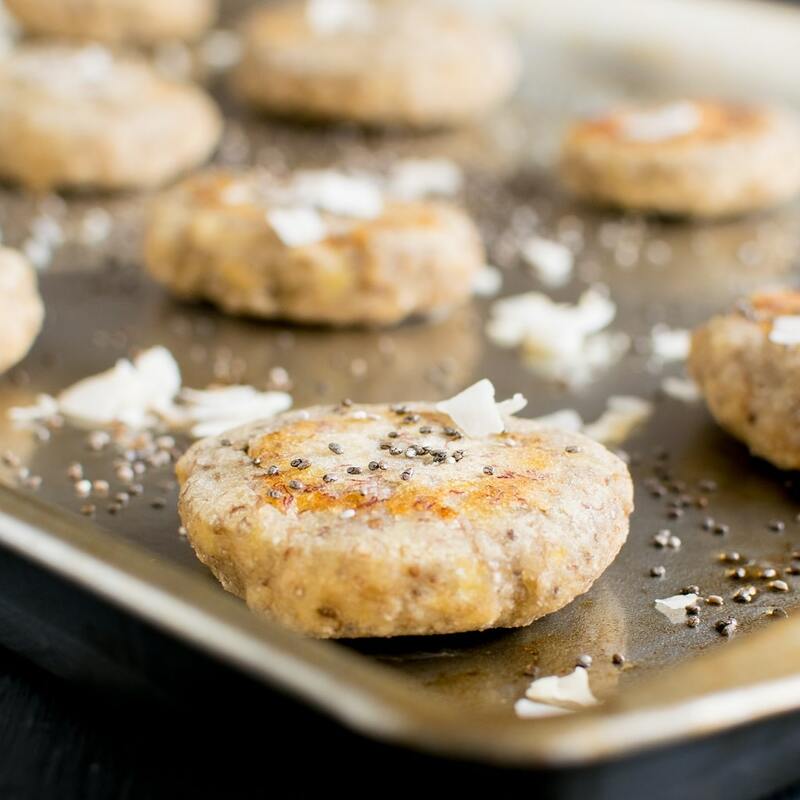 For kids, 3 Ingredient Coconut Chia Energy Cookies serve as a healthy and delicious snack. I served these energy cookies to Yashvi for her evening snack. She totally loved them and hungrily ate 3 cookies. She wanted to save some cookies for later. Again, over the weekend she requested me to bake some more of this deliciousness. She loves banana. So she kept screaming out of joy expressing her love for these energy cookies. Her pleasure and excitement encouraged me to share this recipe with you all. The only caveat of this recipe is that it’s not best looking cookie. However, I guarantee the taste of these cookies. Not to forget its immense health benefits. Preheat oven at 400 degree Fahrenheit and grease a cookie sheet. In a large mixing bowl mash bananas and add soaked chia seeds. Take about 1 tbsp. of the batter and shape it into round cookies. Place it on the cookie sheet. Place the cookie sheet in the middle rack of the oven and bake for 25 minutes. Take out the cookie sheet and flip over all the cookies to the other side. Bake again for 5 minutes. Turn of the oven and let sit for couple of minutes. Take out the cookie sheet and enjoy the cookies warm or at room temperature. The batter will be sticky and thick like soft bread dough. For us the sweetness of these cookies was perfect. However, if serving to kids feel free to dust some powdered sugar or sprinkles to make it more attractive. The purpose of these cookies is to provide for post workout energy replenishment for the grownups. This recipe makes 12 cookies and the serving size is 2 cookies per person. these sound so simple and i love chia seeds. i need to try these! Is this recipe accurate?? Are you sure it is 2 Tbps? Or is it supposed to be 2 teaspoons with 1/2 cup of water? Hi Archer, this recipe is accurate. Chia seeds is used as egg replacer. the basic idea is to soak 1 tbsp chia seeds in 3 tbsp water. Thereafter the measurements changes as per requirements. 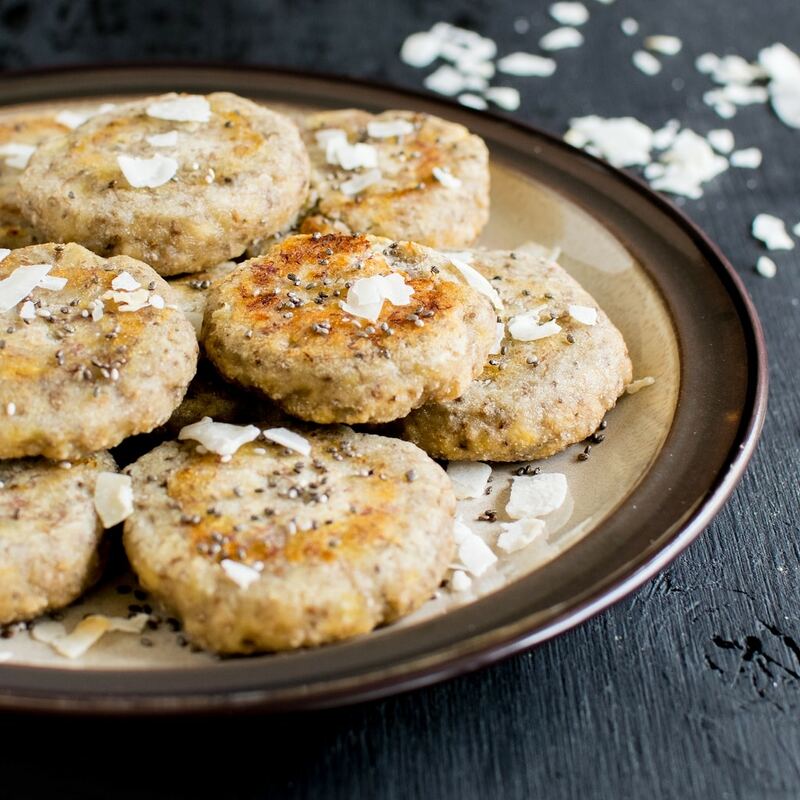 In this recipe chia seeds is the main ingredient to make these cookies fluffy, soft and chewy. Hence, the mentioned measurements are accurate. Thank you for checking on this.